Moisturizer meet sunscreen. With an SPF rating of just 15, this isn’t the kind of sun protection that you are going to wear on a trip out to the beach. For those days, we have stocked up on lots of serious sun protection. 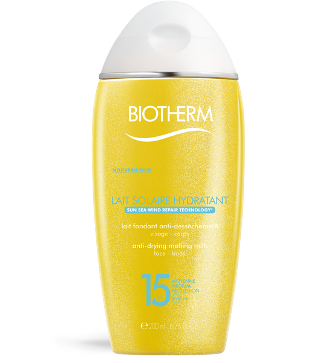 This is the super moisturizing body product that also happens to protect your skin while you’re out. I love it for work days when I will probably be indoors most of the time, but still want protection. It will also be great for the winter when you sometimes forget to wear sunscreen. It does have a tangy lemon scent that smells a bit like cleaning products, so be sure to have perfume ready if you aren’t crazy about lemons. I’ve had some bad luck with spray sun screen this summer. None of them have the right spray with the right power. 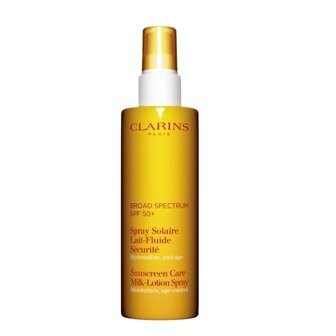 Clarins is getting closer to perfection with their milk-lotion. The spray is a bit weird. It doesn’t spray evenly, so you have to spread it around. The SPF is also just 20, so it’s not strong enough for many people I know. That said, everytime I wore it my skin was totally protected. I didn’t burn anywhere and started to feel really confident in this sunscreen. It goes to show sometimes you have to give things a chance. It’s been so hot this summer that you need a sunscreen that is going to last through everything. 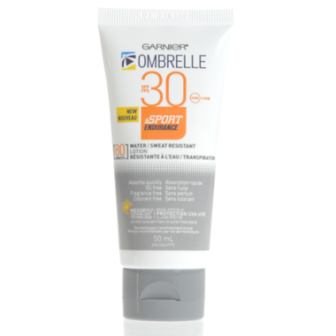 Garnier’s new sunscreen is not just water resistant, but also sweat resistant. I love how quickly it absorbs into my skin and it doesn’t leave any weird residue. My skin still feels like my skin. 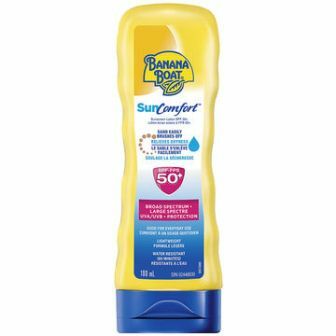 Somehow I’ve made it this long without ever using Banana Boat sunscreen lotion. It might be one of my new faves now. I love the faint smell. I love how it makes my skin feel moisturized. I love how strong it is to protect me from the sun. I’m not sure how I feel about the claim that sand will brush off easily. While I’ve only used it at the pool, I doubt that this is true. Regardless it’s still my new favourite sunscreen.